Show of your Christian pride with this uniquely sophisticated design. A basic bold cross dancing with beautiful blue fowers and green vines. 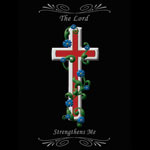 Inspiring scripture, The Lord Strengthens Me fills out the design with elegant bordering in white. Other Christian designs also available.